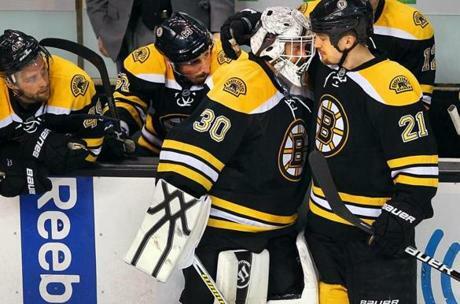 Andrew Ference gave a hug to goalie Tim Thomas at the end of the game as other Bruins sat dejected. 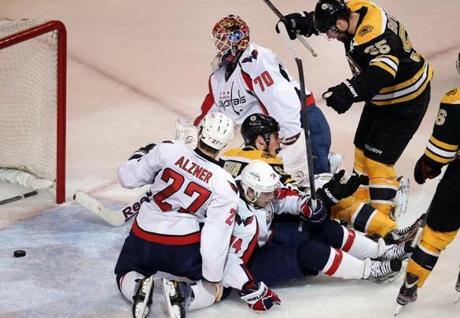 Capitals goalie Braden Holtby was at the center of the celebration as Mike Mottau and Jordan Caron skated to the Bruins bench. Mike Knuble celebrated the Capitals' overtime win as the puck came out of the net after slipping by goalie Tim Thomas. Brad Marchand fell to the ice after being tripped-up by Jeff Schultz in the first period. Milan Lucic couldn't get the stick on a loose puck in front of Capitals goalie Braden Holtby in the third period. Daniel Paille and Roman Hamrlik chased a puck into the boards in the first period. 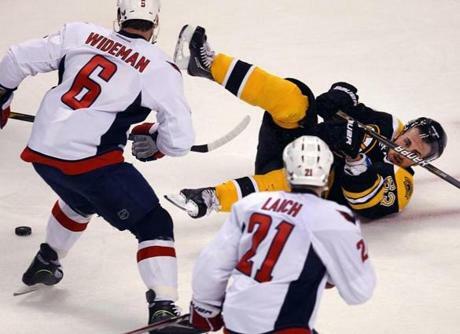 Bruins center Tyler Seguin was leveled in the crease in front of Capitals goalie Braden Holtby. Tyler Seguin scored a goal in the second period to tie the game. 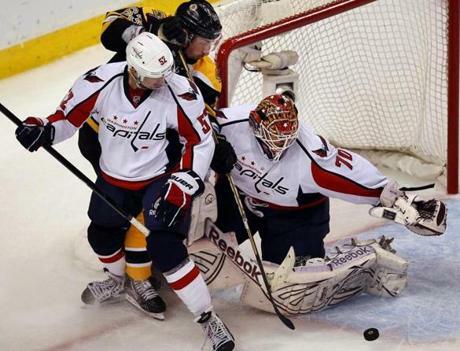 Tim Thomas came out of his net in the second period to make this save on Alex Ovechkin. 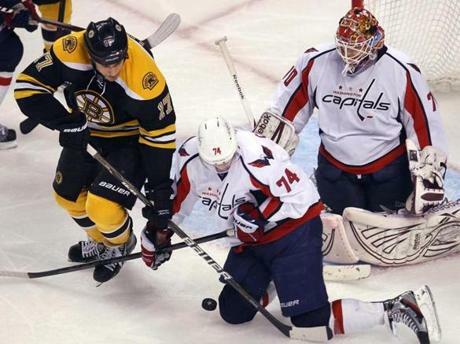 Brad Marchand couldn't get his stick on the puck in the second period as Capitals goalie Braden Holtby had his pad down. 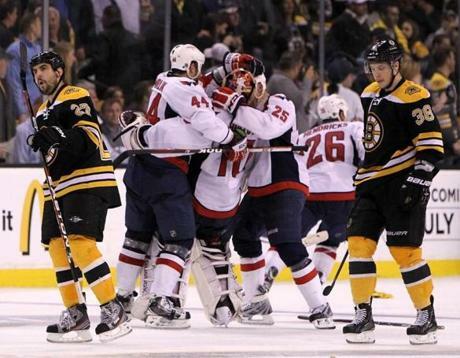 Zdeno Chara and Dennis Seidenberg put the squeeze on Capitals center Brooks Laich during the third period. 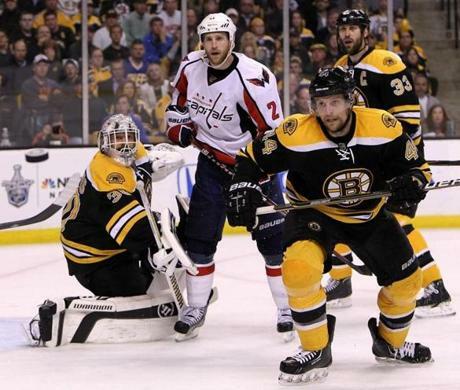 Tim Thomas kept his eye on the puck, at left, during the third period. 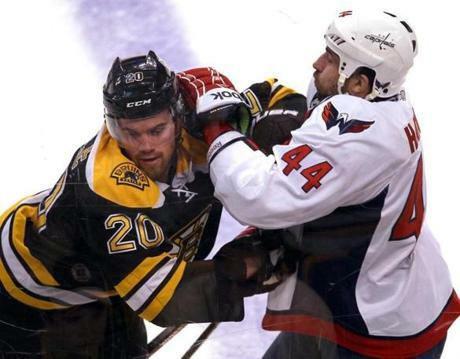 Rich Peverley bumped into Capitals goalie Braden Holtby in the third period. 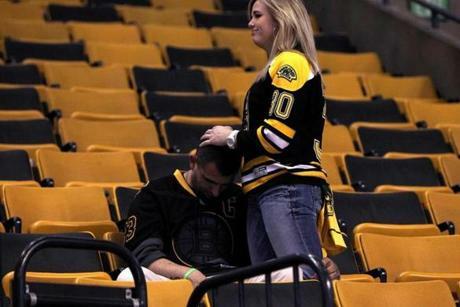 A Bruins fan was consoled following his team's loss in overtime. 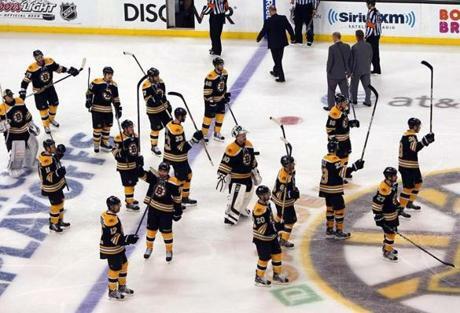 Bruins players saluted the fans at the end of the game.